What is equally visible but not as obvious is that the person has health issues. In 400 B.C.E. 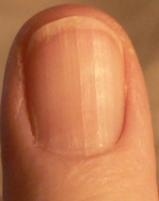 Hippocrates, father of clinical medicine, said fingernails reveal both health and inner condition. He was the first to identify clubbing, where the fingernail bends over the top of the finger, as a sign of lung and heart disease. More common than lung and heart disease are health issues related to nerves and/or blood. Fingernail ridges and faint moons coincide with health issues involving balance, numbness, depression, memory impairment, or in other words, symptoms of low vitamin B12.